No matter what kind of cat you have–-short-haired, long-haired, or even no-haired–-she will need some sort of grooming. The amount of hair is definitely the key to how much time you will have to invest in your kitty. I’ll go over what you need to do for both short- and long-haired cats. Since I’ve never dealt with no-haired cats, I cannot give much advice to you in how to take care of those breeds. Short-haired cats are obviously short-haired by their fur being a uniform length that is not much longer than your finger’s second knuckle. The way to tell a short-haired cat is by the length of hair on its tail. Each short-haired breed has its own standard for its coat, and a well-kept coat will match the breed’s standard. Refer to your breed standard to see what you should strive for. Minuets come in both long- and short-haired versions. We breed mostly long-haired cats, but we have produced short-haired kittens in the past, when we used Riddle Me This as a stud. 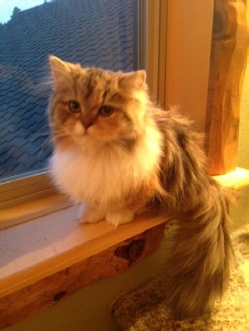 We also had a short-haired domestic rescue, Kayla, who had a silky, luxurious coat. Short-haired cats are easy to take care of. They may still shed, but you will spend less time grooming a short-haired cat on a daily basis than a long-haired cat. Long-haired cats are not always immediately identifiable as long-haired when they are young. Even adult cats of some breeds that are long-haired may be questionable to the novice. Refer to the hair length of the tail. That is what dictates whether the cat is a short-haired or long-haired cat. Some long-haired cats are identified by little tufts of fur on the bottom of their feet. Those might not be apparent when the cat is a kitten, but the tufts will develop as the kitten grows. Long-haired cats are not necessarily terrible shedders. A well-groomed long-haired cat will shed less than one that doesn’t go through a daily grooming ritual. The main concern for long-haired cats is to avoid mats. Matted hair is uncomfortable, even painful for the cat, and annoying for you. Daily grooming of your long-haired cat will prevent mats from either developing or growing. See the following Hair Care section. Every cat needs to have its coat addressed, no matter what the length. The time you spend on brushing or combing your cat is dependent on the length and thickness of its coat, and how much thickness you may want your cat’s coat to maintain. Short-haired cats: Short-haired cats don’t need daily brushing or combing, although brushing your cat can be a method of bonding with her. Cats generally like the soothing feel of a brush going through their coat, and this can be a pleasant way of spending time with her. It also removes loose hair that would otherwise shed. No matter how often you brush or comb your short-haired cat, you should run your hand over her coat daily to check for matting and that the texture is silky and smooth, or as the breed standard demands. Long-haired cats: Long-haired cats need daily maintenance of their coat. This is essential for preventing mats from developing, limiting shedding, and keeping her coat smooth and flowing. I cannot stress how important this is. Running a comb or brush through your long-haired cat’s coat once a day can be done in less than a minute, but it will save you hours of effort and frustration in trying to pick out mats if you don’t. Don’t forget your cat’s tail. If you have a long-haired cat, she likely has a matching tail. You’ll have to run the comb or brush through it as well. Mat removal: The best way to deal with mats is to prevent them from forming. That means daily grooming of your cat’s coat. However, if you end up with a mat, address it immediately with a metal comb. Use the end prong to pick the matted hair apart, holding the hair near the skin to reduce the pull on your cat. If you have a particularly nasty mat that is resistant to your comb, you can employ a seam ripper. The inner edge of the prong on a seam ripper is like a blade and can be used to cut through parts of the mat to break it up. However, use great care if you turn to this tool for help, as the tip can pierce your cat’s body if improperly used. A severe mat may have to be cut out with scissors. This is the most risky endeavor you can turn to. A cat’s skin is extremely fragile and will cut easily. Make sure there is a lot of clearance between the mat and the skin before you attempt to cut it with scissors. Use the seam ripper to get that clearance before attempting to use the scissors. 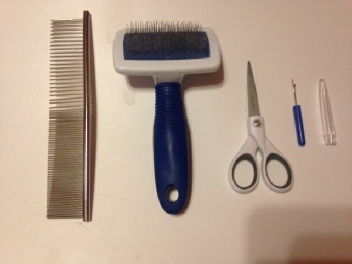 Comb versus brush: I used to brush my long-haired cats every day until I noticed that I was doing damage to their coats. Just daily brushing ended up pulling out a lot of their hair. Their luxurious coats ended up thinned out. I was mortified and immediately stopped using the brush. I went to the metal comb instead. This was the best thing I could do. My suggestion to you, whether you own a long- or short-haired cat, rely heavily on your comb instead of a brush. You can quickly comb out your cat without pulling hair out by the roots. In fact, I rarely use a brush anymore. I only use it at shows to fluff up my cat’s coat for a fuller look. Bathing your cat may seem like a daunting experience, but it is a necessary part of your cat’s grooming. No matter how clean you keep your cat, natural oils build up on its coat just like in your own hair. Shampooing your cat with a pet shampoo will return your cat’s coat to its natural lustrous state. The best thing you can do for your cat is to start a bathing routine when she is a kitten. 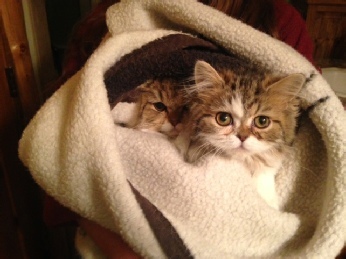 Start slowly, with a wet washcloth to introduce your kitten to being wet. When your kitten is okay with the idea of being wet, progress to a bathroom sink with a little water. Set your kitten in the water and use the washcloth to get her wet again. It’s not important to use shampoo at this point. Right now, you just want to get her use to being wet. She may be a little frightened, but talk soothingly to her. Take her out of the water if she is frantic. Re-introduce her to the water once she has calmed down. Be patient. 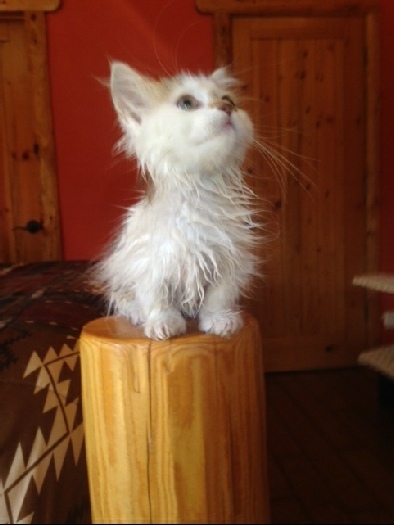 When your kitten is okay with being in the water, raise the level of the water to her chest and start with a little shampoo. Be careful not to get any on her face. You don’t want water to get in her nose or you might have to start all over again with her training. Eventually, with this slow progression of training, you will get your cat to accept her bath. She may not like it but she won’t fight you on it. Her bathing training doesn’t end with the bath. You’ll have to get her used to the blow-dryer. Unless you have a warm environment, prepare to blow dry your cat after towel drying her. You don’t want her to get a chill, or worse, go into the litter box while she is wet. Blow dry your cat on its low setting so you don’t burn her or frighten her with the higher output. Blow drying her will also give her coat a lot of body. Let’s not forget your cat’s nails. Proper trimming of a cat’s claws will prevent damage to your furniture, accidental scratches, and pain for your cat if a nail grows into its pad. This is quite possible for your cat’s dew claws. 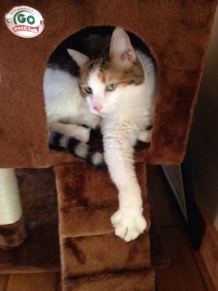 Those are the “thumbs” on the cat’s front paws. They don’t connect with the ground, so they are not worn down by walking. You should cut your cat’s claws every couple of weeks. You may think it to be another daunting exercise, left only to a professional groomer or the vet, but you can definitely learn how to do it yourself. The trick is to gain the confidence of your cat. I work with all our kittens before they go home so they are used to their nails being clipped. Kitten claws are very painful, like hypodermic needles. And a kitten doesn’t know how to retract its claws until six or seven weeks of age. So clipping them is to your advantage. I start to acclimate my kittens to nail clipping by pressing on each toe pad to squeeze out the nail. This is what you will be doing when you clip your cat’s nails. Don’t attempt to clip the nails until you can squeeze the pads without frightening your kitten. When you’ve reached that point, use a pair of pet nail clippers just to snip off the tip of the nail. Again, this is to acclimate your kitten to the process. Don’t risk getting too close to the pink part of the nail, which has blood and nerves in it and will be extremely painful for her if you cut into it. When your kitten is used to the process of clipping the tips off, you can move up the curve of the nail and snip it off. This is all you need to take off to make the nail blunt. 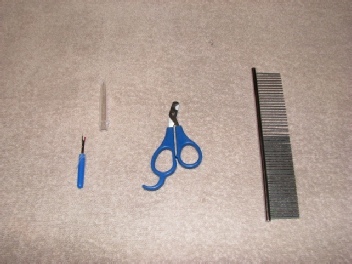 Picture above: A single tool is necessary for taking care of your cat’s claws: the pet nail clipper (middle). This is essential for your grooming kit. Your cat’s eyes and ears shouldn’t be forgotten, although they are easily overlooked. Depending on the breed of cat, your pet’s eyes may water excessively. This should be treated with a tear-stain cleanser to prevent the hair around your cat’s eyes from becoming discolored and tacky. Use a gauze lightly soaked in the cleanser to wipe the tears off the hair around her eyes. Be careful not to get it in your cat’s eyes, even though the cleanser should be non-toxic. And avoid the cat’s nostrils. If a cleaning pad causes irritation, resort to a gauze soaked in warm water. Ears: Your cat’s ears will accumulate dirt over time. Even though you don’t believe it, you can clean your cat’s ears without much trouble. Use a cotton ball with water to wipe away the dirt. Particularly tricky spots might require alcohol on a cotton ball to break up the waxy film. Be careful not to go into the ear canal. Just like being warned not to use a Q-tip on your own ear, you shouldn’t use a Q-tip on your cat’s ears. You might accidentally perforate the eardrum and do irreparable damage. I cannot stress enough how important maintaining the health of your cat’s teeth are. Your cat’s mouth is subject to hoarding food particles in between the teeth and under the gum line. This develops bacteria that promotes gum disease and the deterioration of individual teeth. Proper cleaning is important to ensure that your cat keeps her teeth throughout her lifetime and has no health issues with her mouth. You might laugh, but one of my daily chores is to brush our four dogs’ teeth. I’ve done this for years and always get complimented by the vet. However, they still need annual dental cleanings. Unfortunately, I cannot brush my cats’ teeth. A Minuet’s mouth is so small that even a baby toothbrush will not fit in between the teeth and cheeks. Yet I take my cats to the vet for their dental checkups and cleanings every year, or more often, depending on the vet’s recommendation. A dental cleaning is not cheap but it is crucial. If your cat ends up with a dental disease–which is extremely possible if her teeth are ignored–you will be paying an astronomical amount to repair the damage. One thing I learned in maintaining dental care is that dental cleaning costs vary from vet to vet. Don’t let loyalty to your long-time vet prevent you from trying another, less-expensive vet if the alternative means neglecting your cat’s teeth. After paying close to a thousand dollars for one dog to have her teeth cleaned and a few pulled, I began pricing dental procedures out around the area. I found a vet who will do dental cleanings for half of what I was charged by my long-time vet. Guess where my dogs and cats go now for their dental cleanings. Treats: The best treats you can give your cat are ones designed for “brushing” or “dental health.” These treats are designed to break up food particles and plague for the daily maintenance of your cat’s mouth. They are not to be used in lieu of a dental checkups and cleanings, but to limit the amount of work your vet might have to do during the cleaning. Remember, the less work your vet has to do in your cat’s mouth, the less expensive the bill will be, and the less pain your cat will have to endure afterward. We use Greenies dental treats, which come in a variety of flavors. Our cats devour them. Lastly, the topic of grooming your cat wouldn’t be complete without mentioning the need for proper nutrition. Your cat’s coat, teeth, and internal health are dependent on getting the best nutrition possible. Cats are carnivores and the primary ingredients in their food should be proteins, primarily meat proteins. Too many commercial foods have grains and by-products in their food that put these brands on the lower spectrum of quality food. On the other hand, there are many brands that offer the ingredients necessary to support a cat’s health. These brands are mostly obscure companies that aren’t readily recognized. However, if you do your research, you’ll find a brand that you and your cat can be happy with. Treats: Remember to consider the ingredients of the treats you give your cat. Don’t feed your cat the best food possible and offset it with poorly balanced treats. Note: Cats should not eat uncooked human-quality proteins. If you are going to treat your cat to food off your plate, make sure you give her cooked meat and fish. Another beware is milk and cream. Don’t be fooled by the idiom that cats and milk go together. Milk and milk products can cause dietary issues with your cat. If you give her milk, let it only be a few laps. Better yet, don’t get into the habit of giving her any at all. Finally, chocolate and onions are a great no-no. Make sure no table scraps have these ingredients in them.